Tonight I achieved another first, in a long line of firsts. My first mortises, in my own shop. I chopped a single mortise when I attended the woodworking course at Roy Underhill’s Woodwright School but that was under controlled circumstances, and under the watchful eye of Roy himself. These are not very pretty, but they are mine all mine. These are for my Frankenbench that I am building when I can. The legs are scavenged from a bed frame that I have been holding onto. One pair of the legs had really ugly mortises (uglier than mine, can you believe it?) that I will be able to re-use. The other pair of legs came from the head of the bed, and didn’t have the same mortises. So, I grabbed my gauge, marked it up and started drilling out the waste. It felt good to be able to do something simple like that without having to fake a tool or wonder if I was doing it right. I knew enough about this operation either through reading books or online, or having seen it on Roy’s show. Plus I got to use the big hammer for it’s intended purpose, thumping a chisel into wood. I still need to cut some of the side railing from this bed frame into some short stretchers to fit the mortise, and glue up the leg pairs and fit them to the top. I’ll admit to being a little nervous about this part, so I’m going slowly. The bench top (a riff on a Nicholson top) is upside down on some sawhorses I got at IKEA. Scoff not! I actually like these things a lot. We got them on sale a couple years ago intending to build an adjustable height work area for my wife to use in her sewing room. We never did get around to building that out like we wanted because my son came along and distracted us quite a bit from everything. They do that, I understand this now, but wouldn’t trade it for the world. Once I’m done with the workbench they might actually go into service in the sewing room as a desk, but that’s a project for spring I think. 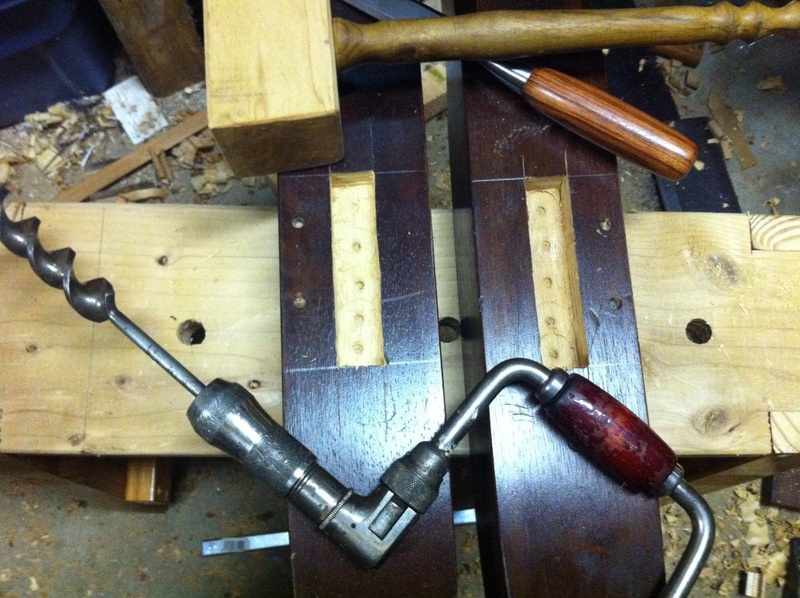 I fit the end vise and drilled the holes for it. I just need to drill some counter sinks for the bolts into the top and I should be able to bolt it on. All in all I made some really good progress after being stalled for so long. If I can get this build and solid, I can start working on actual projects theoretically. And I will be getting some well deserved time off from work for the holidays, which is mostly eaten up by birthdays (3) and family gatherings for the family (2), but I will be able to get a few days here and there to work. Also tomorrow I found another painting that actually solved a little mystery on one of the planes I discovered a while back in 1574 painting. More to come on that.